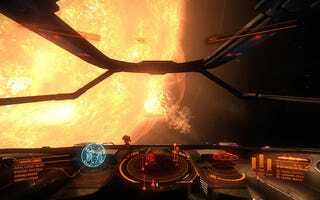 Today, Frontier Developments launched the third beta phase of their open-ended PC space sim Elite: Dangerous. The Beta 3 update adds a bunch of welcome new features, and likely gives an even better sense of what the final game will be like. The Beta 3 comes pretty close on the heels of the sizable Beta 2, which I actually barely had time to check out, despite sinking a couple dozen joyful hours into the first beta. I've pasted the full list of updates below. A lot of these sound good, but I'm most excited about multiple ship ownership. Finally, I can own both a dogfighter and a long-haul freighter! Some of that sounds pretty great. I'll have to carve out some time from the other fall games to go play, if only to go fuel-scoop off of the surface of a star. Frontier says the full game is coming "in Q4," which means late 2014 or early 2015.